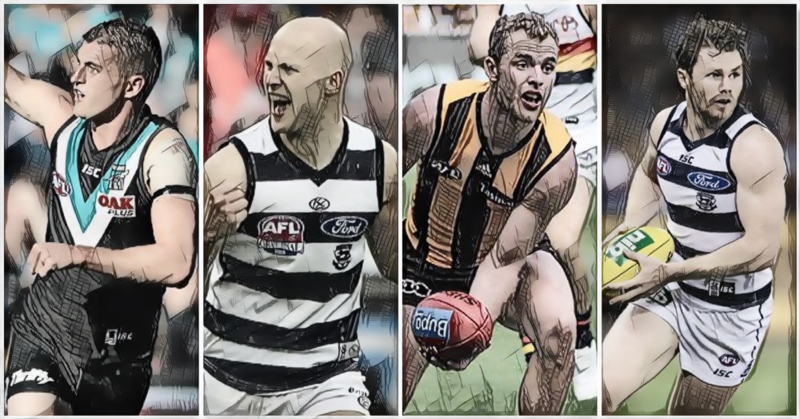 Revisiting the Ladder Predictor — The Mongrel Punt Become a Patron! While there is no doubt their stat collection and distribution is some of the finest work in the world, the way they use their “algorithms” to predict things like fixture strength frustrates me to my core, and that’s what I’ll be looking at today - how Champion Data rated your team’s fixture before the season, and where they stand three rounds in. It goes without saying that the people at Champion Data aren’t a big fan of “what ifs”, and stick to only the “what will” happen in a season. To make that a little clearer, they’re the Dr. Strange in Infinity War saying there’s only one possibility of succeeding against Thanos. It's their way, or it's nothing. Now that my Marvel plug is over, let’s look at which teams apparently had the hardest fixture going into the 2019 season according to CD, and reassess based on what we now know about the teams heading into Round Four. I’ll fire up the old ladder predictor and base my results on what I’ve seen to date. While I tend to disagree with most of what CD puts out, going into this season, to face these five teams twice looked quite daunting and could have easily resulted in 5-8 losses. However, after starting the season 1-2 with losses to Geelong and West Coast, and with Richmond losing key players to injury, Melbourne having no forward line structure, and Essendon looking like the same team they were at the beginning of the 2018 season, it looks like Collingwood have struck gold. With one loss to the Eagles early on it’s safe to assume that they’ll lose again out West. They play the Dogs at the ‘G’ and then again at Marvel Stadium later in the season the week after their bye, so two wins do look likely. Top eight should be a lock. Double-Ups: Geelong, West Coast, GWS, North Melbourne, Brisbane. In my opinion, Hawthorn have the hardest draw of the season. After losing Tom Mitchell, many questioned this team’s ability to be the team they were last year and three weeks in, despite a fade out against a rampaging Bulldogs team, they haven’t missed a beat. Despite being -21 in the clearance department, they have laid 21 more tackles in their forward 50 against their first 3 opponents and as we’ve seen in the past, forward pressure wins flags. To their fixture now - despite a strong start to the season, I see them struggling, but pushing through as Hawthorn tends to do. They can potentially lose 8 of 10 games against teams they play twice depending on what North Melbourne and Brisbane sides show up. I think it’s safe to say that no team has an easy game against the Lions up at the Gabba and Brisbane have earned the reputation of being tough at home through the first three rounds. I expect this team to finish around the bottom of the eight. I’m not going to gloss over this - North have really disappointed me. After a strong season from their young list, finishing 9th, finals were almost a lock in my eyes. The additions of Polec, Hall, Pittard and Tyson seemed to make this team even stronger, but they’ve gotten worse. Much worse. I wouldn’t tip them over anyone currently. Their foot skills have been abysmal, and they don’t seem to have the same run and flair we saw last year. Maybe they got spooked by the name change of their home ground and are waiting for Nick Fury to press a button to summon help. Or maybe I just threw that in there to create another Marvel reference? Could we be gunning for a high level sponsorship deal? Someone tell me how the team that won the flag without Gaff and Nic Nat can go into the season without being favorites to win it again. That really pissed me off. Punters of Australia, pull your heads in. To their draw - not much has changed with the difficulty. I see Adelaide slotting into Melbourne’s spot as the most difficult team they have to face twice. They play the Cats, Crows, Swans, Hawks, Dees, and the Tigers all away from home during the season. If the Demons and Tigers pull their fingers out, they could be looking at six losses, and with a loss to Brisbane at the Gabba in round one already factored in, you really start to wonder how good this team needs to be in order to just make finals. I understand that being a Perth team will have its advantages, but both the Eagles and Freo rack up miles like no other team. With the soft spot I gained for them after seeing them crush the hearts of Pies fans in the Grand Final last year, I’ll put these guys in the top 2. Yikes, this team is screwed. We all loved to jump the gun on them at the start of the year after their big finish to 2018 and what seemed like the emergence of Tom McDonald and letting go of Hogan didn’t seem too bad. Boy, what they would give to have him back. McDonald is averaging a whopping 10 disposals and has kicked 1 goal in his first 3 games. Not to let Petracca off too easily, he’s getting 16 disposals a game which is ok, however he has kicked 2.1 so far. Three scoring shots in three games for a big moment player like himself should be eating him up inside, and I hope it is. Yes, I’m salty they beat my Cats in the final last year and secretly love their struggles. Onto the fixture - they may snag wins against Richmond, Sydney in Melbourne and the Saints, but I don’t see them beating the Eagles or Pies; not with their forward line. Their next month looks ominous as well, Sydney at the SCG, Saints, Tigers and Hawks at the G. Could they start 1-6? Just like Melbourne, Yikes! What happened, Bombers? A 72-point thrashing at the hands of the Giants in round one was bad enough, but to follow it up against the Saints with another bad loss and then a great quarter to get them past Melbourne… what’s going on!? I honestly don’t know where to go with this team. Against the Dees last Friday night I thought “Oh crap, I wouldn’t want to get in the way of this team on the run”. Five minutes later I was laughing at Zac Clarke as he failed to goal from a simple kick, burning two teammates in the process, and then the Bombers proceeded to have 17 players on the park at a centre bounce. Come on Essendon, you can be better, you should be better. You’re not a bad side yet you play like one. I’ll just wait until my Cats play you to turn your season around again like you did last year. To the fixture - the doubles look friendly enough. GWS and Fremantle have a history of playing poorly in Melbourne so they should be wins for Essendon. North is being frustratingly bad, so those should be wins. After this start, I don’t see the Bombers stringing together enough wins to make the eight however, resulting in them finishing in the 13-18 bracket this year. This team won’t say die. Yes, they started 0-2 and they struggled to beat Carlton, but I love the way this team operates. They run under the same rules of Geelong and Hawthorn - implementing the never give up attitude. The league may push you toward the bottom with eqilisation, but that doesn’t mean you have to go quietly, if at all. Fortunately, Sydney’s time in the top eight may not be over and it may be because of their favourable draw. Melbourne are playing terrible footy, Essendon aren’t far behind, and Carlton are terrible. That makes for six likely wins. They play very well against the Cats in Geelong so I expect a win against them. Add in some easy games against North, Gold Coast, Carlton and the Saints at the SCG. They could scrape in but I think others have it better. Freo, Freo, Freo… my first Grand Final experience was also yours and you disappointed both of us. I don’t really know where you stand this year; you thumped North and looked great, articles were written about Ross Lyon and how he adapted better than anyone to the 6-6-6 system. So then you lost to the Suns. Last week you beat the Saints and didn’t really impress too much in the process. Hopefully Fyfe’s concussion isn’t as severe as suspected, as I’d love to see a near-full strength Freo take on the Eagles in the Derby this Saturday. Their fixture is nice and slightly favourable, playing Richmond, Brisbane, Carlton, Sydney and Geelong at Optus stadium. Combined with their five double ups sees 10 games at home that are all very winnable. The questions mark is probably the games against the Eagles, but you never know what will happen in a Derby. Maybe a finals berth is on the cards, but I think they’ll just miss out. I rate these guys; I rate them very highly. Jeremy Cameron has jumped out to lead the Coleman after his seven-goal performance and he is just looking phenomenal. I can see many bags in his future. Double fixtures against Richmond, Sydney, Essendon and Gold Coast sees 8 easy wins if they keep up their current form. Bit of a tough road schedule with the Cats, Hawks, Demons, Crows, Kangas, Bombers, Tigers, Power and Suns to come. It’ll test them with three of those games at the ‘G’, but if they can pull out a couple wins, I’ll be liking them come September. What is it about the South Australian teams that makes me want to hit every player on them with a brick? Too far? Probably? Definitely, but still, I can’t stand these guys. Their fans are just as bad as Richmond fans - only rocking up when they’re playing well, but I don’t think this is their year despite their decent start to the season. They beat a woeful Melbourne, a woeful Carlton and blew a lead against the Lions. Lucky for them, the fixture is in their favor. Richmond, North, Gold Coast and Freo should equate to a few easy wins at home, and after a look at their fixture, their away schedule doesn’t look too rough. They’ll scrape into the 8. I’m not going too deep into this; they’ve turned into the Brisbane of two years ago - proud losses but no wins. They may steal a win from a team on a bad day, but their list is the worst in the comp, at least the Suns’ list is well rounded out the a good middle tier. The Blues just seem to have too many list cloggers. Every year. I won’t lie, I wasn’t looking forward to writing this. Three rounds in and we’ve knocked of 3 flag contenders and I can’t see us losing many games this year. North, Adelaide and the Dogs should add an additional five wins, since they’ve already got one from the Crows already. The Swans have a thing with beating the Cats in Geelong so I expect them to steal a win and the Hawks… well, you never know when they play the Cats. I hope it’s a good game. Brisbane, Freo and Port away seem like the only games that are tough as long as they can keep up their pressure at the G. Those four games in Melbourne could be a sign of what’s to come in the Finals. Still though, bias aside, top 4 finish easy for the Cats. Boy did I have a big smile on my face once I finished my ladder predictor and saw the Tigers sitting at 15th. I even double checked their games and to be honest, I think it’s a fair spot to put them. Rance is done for the year, Martin has turned into a below-average player and seems disinterested, Riewoldt and Cotchin now have injuries and will miss a couple of weeks. I didn’t see them defending well without Rance, and now I just don’t see them doing anything this season. Tom Lynch came to Punt Road and brought his propensity to get injured with him. I’m not going to go through their fixture because I don’t think their opponent matters when they are missing key players and once they return the hunger won’t be there if their leaders can’t stand up. They’ll get an easy draw in 2020 after a poor finish this year and will finish top 4 again. Wait and see. I like these dogs; I like them a lot. Their hunger for the ball has returned to their flag winning ways, led by a slightly overrated Bontempelli (attack me, I’m ready) and an underrated Libba and Hunter. They are primed to make a push for the eight, but I think they will fall short. They have a friendly fixture, while they do have to play the Cats and Pies twice, along with the Lions in Brisbane, they also play Carlton x2, Richmond, Brisbane, North, Demons, Saints, Fremantle and Essendon all at Marvel. It’s very possible that they’ll sneak into the eight, but they fell short in my predictor. Here’s the thing, the Suns are impressing me so far but I think it’ll be short-lived. A lack of scouting on their players has led to some exploited match ups, but it won’t take long before they begin to crumble once teams understand them and start counter-punching. After Carlton this week they have a hard run where they could lose seven in a row. My fingers are crossed for this team, but I don’t think they’re causing any headaches this year. Bottom four. This damn team. I tipped them to make the eight this year. I didn’t tip them to make the top four, but in my predictor this is exactly what happened. Their draw is splendid and the some really tough games they do have are up at the Gabba which is starting to get the look of a fortress about it again. It’s just as threatening as the Cats in Geelong or the Eagles at Optus. They have Collingwood, Sydney, Adelaide, Hawthorn, Melbourne, Geelong along with their doubles up there. If they can get up in those games, lock up a top four spot for the lions! Like I said with Port, I hate Adelaide teams. The Crouch brothers have faces that should be used as target practice and Gibbs has a head that I’ve grown to hate. Sorry to all you South Australians, I really can’t help myself. They have an easy fixture on the back of a really poor 2018, and if it wasn’t for their rough doubles against the Cats, Eagles and Power, they could finish higher. Time will tell, but at 1-2, they need to get going. Bottom of the eight for them. You’d hate to be a Saints fan - you came so close around 10 years ago and nothing has happened since. Other than Riewoldt making the transition from footy to TV, what have the Saints done since that grand final loss in 2010? They have the easiest fixture so good for them. They’ve started 2-1 so good for them, but they also have an underwhelming list, and I can’t see them staying strong at the business end of the season. A bottom 6 finish would do them a favour and give them another good draw in 2020. Good luck in the draft. Thanks for reading. Stay Mongrel.